Be Prepared for the Updated Patent Bar Exam with PRG’s Patent Bar Review Course! Our March 18-22, 2013 Classroom course in Alexandria, VA (and all subsequent Classroom courses) will be updated to reflect these changes, as will our Video Course. 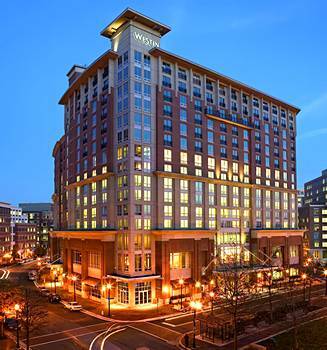 March 18-22, 2013 in Alexandria VA at the Westin Alexandria. May 6-10, 2013 in Chicago, IL at the Four Points by Sheraton Chicago. June 17-21, 2013 in Boston, MA at the Colonnade Hotel. The Westin Alexandria, location of the March Classroom Patent Bar Review. You can also purchase the Online Video Course, which is now available through the intuitive, easy-to-use video-on-demand interface on the PRG website. The Video Course provides all of the same instruction and materials as the Classroom Course, with the flexibility of proceeding at your own pace. Detailed course presentation slides that facilitate note-taking and are an indispensable resource in organizing your study-time and review after the class. Free access to the new and improved online version of ExamWare®, our highly-acclaimed patent exam preparation software. With PRG’s Bar Review Course, you always receive the most comprehensive level of preparation possible — we cover all topics that could be included on your exam and provide in-depth analysis of approximately 100 questions from past exams throughout the course. The course will also cover all changes to the Exam based on provisions from the American Invents Act, so be prepared for the updated Patent Bar Exam after April 2013 by studying with PRG! Register online or learn more about the Bar Review Course. Register now by Fax or Mail. Learn more about the hotels. Last Chance to Attend Our January Course and Receive the Online Video for Free! Our first classroom Bar Review Course of 2013 is next week! If you sign up for and attend this January 21-25, 2013 classroom Bar Review Course in Pasadena, CA, we will give you the video course for FREE! This is an $820 value, so don’t pass up this chance to supplement your classroom work with our video course at no cost to you. As always, both our video course and our classroom course reflect all the latest changes to the law and to the USPTO registration exam. The USPTO announced recently that they will be updating the registration exam in early April 2013 to reflect the provisions of the America Invents Act (AIA) that take effect on March 16, 2013. Why not prepare now and take the exam before it changes in April? Classroom Patent Bar Review Courses Across the US in 2013! In-depth analysis of approximately 100 questions from past exams throughout the course. Free access to the online version of ExamWare®, our highly-acclaimed patent exam preparation software. The Hilton Pasadena in Pasadena, CA from Jan. 21-25, 2013. Attendees of this course will also receive the video course for free, an $820 value! The Westin Alexandria in Alexandria, VA from March 18-22, 2013. The Four Points by Sheraton Chicago in Chicago, IL from May 6-10, 2013. The Colonnade Hotel in Boston, MA from June 17-21, 2013. Continue to check the PRG website because additional 2013 classroom courses will be announced soon!